This Kickstarter-funded documentary about the making of Steve Wozniak’s brainchild, the US Festival, focuses on the first one from 1982. While one would’ve loved full-length performances from the likes of Oingo Boingo, English Beat, and Gang Of Four, some of the more defiantly different bands of the era, you get full-lengths from the artists that are primarily interviewed like The Police, Tom Petty, and Fleetwood Mac. It’s an interesting piece to watch, but it feels more like vignettes over a full-length film. There are stops and starts throughout, much like chapters on a DVD player, so it doesn’t make the film feel cohesive. That’s ultimately the most frustrating aspect of the film. Interviews with people like Kate Pierson from the B-52’s and Stewart Copeland of the Police really help to understand how massive of an event this was. For those of us who were not even a thought in our parents’ minds when the two festivals happened, this is a good document of an era that ultimately helped spawn festivals like Bonnaroo and Coachella. 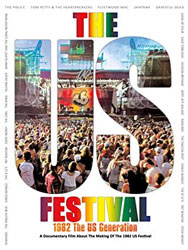 Ultimately, while this film isn’t the best, it should help to restore the enormity of the US Festivals and try to put it back in the consciousness of those who weren’t there. In its time, it was comparable to Woodstock and CalJam, but it’s become a mere footnote at this point. The film does do a great job of telling the festival’s story, it could’ve just been executed better.